We are based in Asahikawa, a city located roughly in the center of Hokkaido. In Asahikawa, the temperature changes a lot throughout the year. Our summers are warm and our winters are famous for being the coldest in Japan. But even in the coldest days of winter, the Asahikawa locals are some of the most warm-hearted people you’ll meet. And when it comes to their favorite food, look no further. With an extensive menu including inventive chicken recipes and a wide range of authentic Japanese shochu – Japan’s most popular spirit – Yakitori Tsuyoshi has taken Asahikawa by storm. Stop by and enjoy shochu and friendly conversation at the bar, bring your friends and enjoy our chicken dishes together, and make sure to ask for recommendations about our shochu. 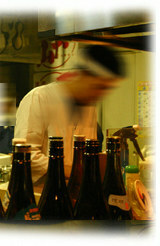 Our proprietor is a shochu expert and will be able to suggest just the right shochu for your tastes. The staff of our legendary Asahikawa restaurants are looking forward to serving you. Yakitori is a Japanese soul food. Fresh chicken or pork is skewered, grilled over a charcoal fire and then served with seasonings such as tare sauce or salt that differ from one restaurant to another. In recent years, a new dish called Chappu-don has become popular on Japan’s northernmost island. Hokkaido restaurants marinate pork loin in tare sauce, grill it over the same charcoal fire, cut it into pieces that can be eaten easily with chopsticks and served on top of freshly cooked rice. The salty-sweet sauce and the soft pork loin create the perfect combination of flavors and textures, and the tare sauce leaves the rice tasting great too. 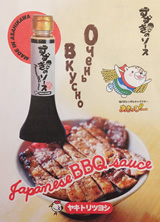 Suzuki sauce is a barbecue sauce you can use to make chappu-don easily at home. This additive-free sauce is made from water, rice and soybeans from the nature-rich island of Hokkaido, with soy sauce and sake as a base. Pop it on your meat for an easy, healthy Japanese meal at home or at your favorite yakitori restaurant. 1. Marinate one piece of pork loin per person in the sauce for around 10 minutes. The amount of sauce can be adjusted according to your preference. 2. Heat up a frying pan and fry the meat at medium heat. 3. After the meat is cooked all the way through, cut it into bite sized strips and place it on a plate. Serve with your preferred amount of sauce. Enjoy a meal in a place where the bar by the grill is packed with friendly people and the restaurant is filled with laughter. Each of our skewered foods is grilled with loving care and our elaborate a la carte dishes are also hugely popular. These great foods are topped off with a wide variety of sake and shochu. Your trip to Asahikawa is not complete without a visit to Yakitori Tsuyoshi!